New games from NetEnt always make us salivate. They’re one of the few game providers who virtually guarantee an excellent release each and every time they come up with something new. So have they managed to strike paydirt again with the Secrets of Atlantis slot? Get up to £100 bonus with 100 free spins + 75 free spins on 2 further deposits! The Secrets of Atlantis slot is a 5 x 4 NetEnt slot with 40 fixed paylines. It takes you beneath the ocean – not a unique concept in slot games, by any means – and shows you a selection of reels with one more level than you might be used to. The title reveals where you’re going, and you will indeed find a mermaid in the mix of symbols provided. While the theme isn’t the most innovative here, there are some nice features that have been added to make this feel like a new game. It’s the mix of features here that make the slot appealing, because none of them are particularly surprising on their own. With NetEnt at the wheel though, you won’t be driven away from wanting to learn more. The NetEnt Secrets of Atlantis online slot does well on the graphics front. There are suggestions of long-lost buildings and structures in the background. 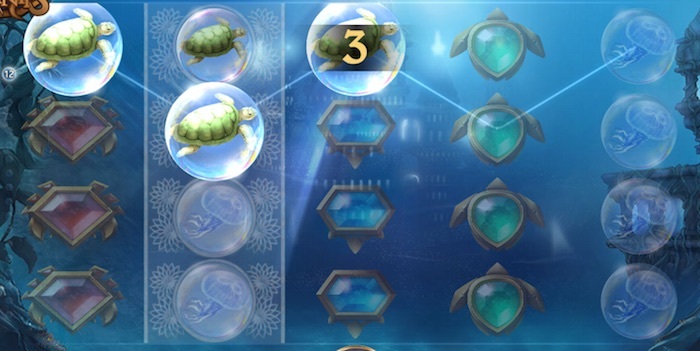 The reels are not divided as they normally would be, so you just get four rows of hovering symbols in five columns. The entire game is very smooth to play and once you know where the paytable and instructions are, you shouldn’t have any problems at all. The paytable is easy to miss in the Secrets of Atlantis slot. You’ll find it by clicking the ‘i’ button next to the bet amount on the left below the reels. It took us ages (must have been a bad day…). Anyway, it has six pages that describe the various features. You can also click the small question mark lower down to read more about the game. Basic symbols include a pearl in a clam shell and various other symbols in bubbles, by the looks of it. They’re all very detailed. There are other more interesting features to discover alongside the normal ones though. Firstly, this is a Win Both Ways slot game. That means you don’t just pick up prizes for winning combinations from left to right, but from right to left as well. You’ll notice the middle three reels can sometimes appear with a highlight on them as well as the usual symbols. It looks a bit like an ornate net. The idea with this is to try and highlight all three of those centre reels. When you do, you’ll be rewarded with a Colossal Re-spin. You might have come across Colossal symbols in other games. Here, the Colossal re-spin means larger symbols measuring 3 x 4 positions in size will spin in the middle three reels. They can appear on one to all four positions depending on how the spin stops. If you manage to stop the reels with the Colossal symbol fully in view, you get another Colossal re-spin on top of any prizes you might have won. The wild in this game is the mermaid we mentioned earlier. She’s not just a regular wild though – she’s known as a nudge wild. The idea is that if she appears only partially on a column, she will be nudged up or down so she fills that entire reel. She also has the power to show up as a Colossal symbol. That means if you get one of those spins and she appears in the centre position, she’ll be nudged into place so she takes up all three of those central reels. Yep, you could get a wild covering 12 positions in a block. Now wouldn’t that deliver some nice wins? Some people might note there are no free spins here other than the Colossal re-spins. Mind you, the chances of winning big on those spins is pretty good, especially when you consider you are playing a Win Both Ways slot game. The opening screen after the game loads reveals the biggest prize here is 320,000 coins. Wouldn’t that be nice? Your cheapest bet is just 20p but you can go much higher to hit the £200 maximum. Both the coin values and the number of coins played per line can be altered underneath the reels. As for the return-to-player info, the RTP for this game is an impressive 97.1%. That’s very good indeed. 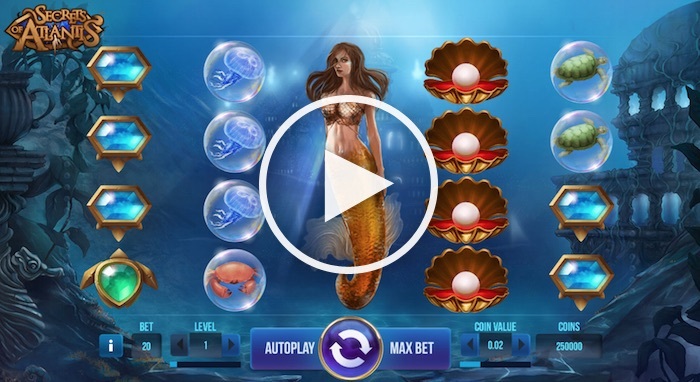 As new games from NetEnt go, the Secrets of Atlantis slot is a winner in our book. We managed to trigger the Colossal symbol twice in a row and had the nudge wild in action as well – both quite soon after starting. We’d say players may not have much incentive to keep on playing for a long period of time, but it depends what you want to get from a slot game. This one benefits from quality graphics, an unusual mix of features and a generous RTP as well. These elements alone make it worth playing. But of course you have to make your own mind up about that when you try it.